Multiple intelligence agencies are tracking Mansur Haider, a god-fearing aspiring cricketer from Kashmir. His girlfriend, Aahana Yajurvedi, is trying to locate her missing mountaineering team, which vanished after a mysterious earthquake struck Shaskgam Valley. Investigating Mansur and the Shaskgam Valley incident is Swedish Intelligence Officer, Adolf Silverskiold, whose only relationship to god consists of escorting his girlfriend to church. Which Biblical Weapon was tested in Shaksgam Valley? Why is Mansur Haider important? Is there a solution to the Kashmir Crisis? Can destiny be controlled? Does a cosmic religion exist? 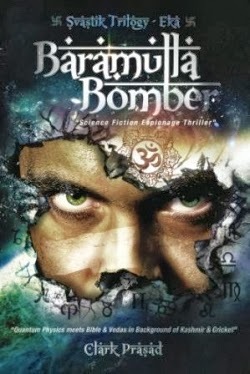 Review: Baramulla Bomber. What a name! It is said that a good title works wonders irrespective of the plot and believe me Baramulla Bomber has an interesting plot to narrate apart from the captivating title. And so when Blogadda came up with the review, I applied immediately and thankfully was chosen for reviewing the book. And am pretty pleased to have read this book! It does take time to read 300+ pages but not even for once you will allow yourself to put the book down. Infact I regretted many times after putting the book down for various reasons as you always start thinking what will be next in the plot. Such is the plot filled with Vedas, science fiction, espionage, quantum physics, cricket and politics. All nicely put together to what is called ‘Baramulla Bomber’ – Part one of the trilogy (Svastik Trilogy). The beginning is where the royal descendants meet where a blasts take palce and most of them dies, apart from the one Abhimanyu Kashyup. And from there on he vows to keep the secret discussed alive as the plot starts to keep the readers engrossed into it unequivocally. The plot is racy with a nice timeline at the start of every chapter that helps in easing the confusion with lots of plots, people and places put together simultaneously. The plot is based in India and Sweden. What amuses me is the way the author has kept on introducing new characters in a subtle way without even once letting the readers to flip back pages to remember the names of the character. Apart from that the humongous amount of research that has gone into it has made the plot look rich filled with substance worth reading. I didn’t find much to criticize as I was left spell bound after finishing the book. Writing: The writing is crisp and clear without any grammatical and other errors which shows a good proof reading is done. The tone of the language is pretty Indian which is nice. Overall: A must read science fiction espionage thriller, which will keep you at tenterhooks and eagerly awaiting for the second part of the trilogy. A thriller of a novel not to be missed! !